I struggle with dry hands anyway but combine that with the cold weather and a job which demands constant washing and you've pretty much got the perfect recipe for dry itchy hands. Normally I'd use an overnight treatment but what I like about Hand chemistry extreme hydration concentrate is that it's got a lighter creme-gel texture so can be used during the day too. It's packed with moisturising ingredients and since using this I've noticed a big difference in the condition of my hands. After 10 days it claims to offer long lasting hydration and I'm looking forward to seeing the results with continued use. In winter I'm obsessed with slathering on rich moisturisers and oils but the downside is that my skin can start to feel a little congested, which is where Liz Earle brightening treatment mask comes in. There's witch hazel and white clay to detoxify as well as aloe vera and camphor to help boost radiance. Plus it gets to work in just 2 minutes, ideal if like myself you're always finding yourself short on time! On a day to day basis I'm all about quick and easy make up and since discovering Maybelline baby lips in cherry me it's not left my handbag. It's a really beautiful berry pink shade which adds a hint of colour whilst at the same time moisturising and protecting my dry winter lips. Not to mention that it smells absolutely delicious! 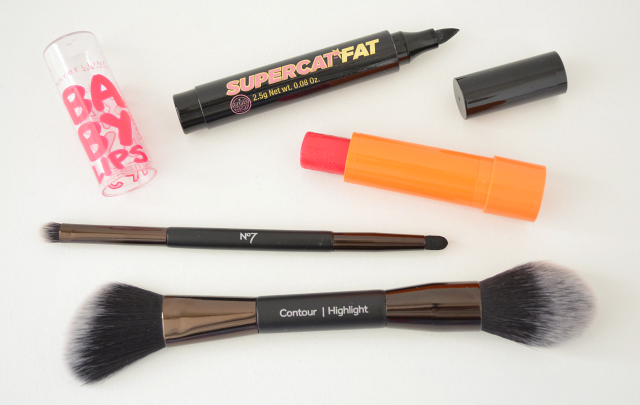 At the weekends though I tend to make a bit more of an effort and I'm really liking Soap and glory supercat fat liner. It's thicker than most of my other eyeliners so perfect for a more dramatic look and because I'm not having to go over the line repeatedly there's less chance of mistakes. Pen style eyeliners have always been my favourite and with this it's really easy to control, pigmented and smudge proof once dried. Finally some new make up brushes courtesy of Boots No 7. The contour and highlight brush has become a daily essential depositing just the right amount of colour to perk up my face and on days when I contour the angled brush fits hallows of my cheeks perfectly. The smudger brush whilst not as much an essential is a lovely addition none the less and as the name suggests is great for smudging out eyeliner when creating a smokey eye. On a little side note if like myself you struggle with small eyelids then the brush end is great for a more precise application of eyeshadow. Well worth a look next time No7 do their money off vouchers. 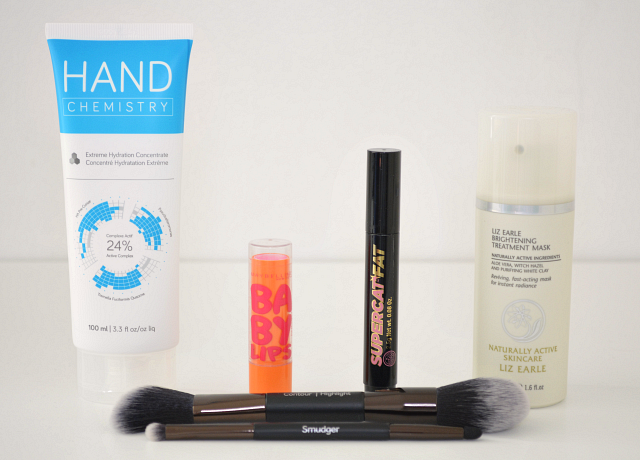 Have you tried any of the products above? What are you currently loving?